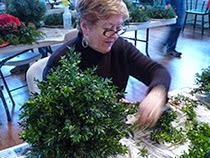 The ladies of the Circle have been busy all year long preparing for the Annual Christmas Fair. You will find many one-of-a-kind items including hand-knit hats and scarves, gifts for adults, teens, children and pets, gourmet foods, potted bulbs, holiday greens for inside and out and so much more. Lines form before the doors open! Come early and do your gift shopping! Come early for the best selection! Free to all. Gifts for everyone on your list. A reservation for the Luncheon a must! Reserve a table for your group - please call Linette French at 978.283.2247.